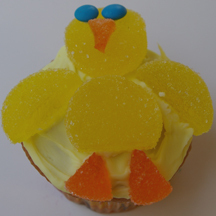 Cut apart sugar-coated fruit gel or “gem” candies to make these chick cupcakes for Easter, a farm party or anytime. They also make cute baby shower cupcakes. What You Need: 1 cupcake; yellow or other light-colored icing; 3 yellow fruit gels or gems; 1 orange fruit gel or gem; 2 blue mini M&Ms; scissors, kitchen shears or knife. How to Make It: Frost cupcake. Cut a small (approx. 1/4 inch) amount off the bottom of one yellow fruit gel for chick body and position about 1/2″ from bottom of the cupcake, cut edge facing down. Cut second yellow fruit or gel or gem in half and position to left and right of body for wings. Place third gel on top of body for head. Cut two medium triangle wedges for feet and a small wedge for beak. Adhere beak and blue M&M eyes to head using small dabs of icing. This entry was posted on Thursday, June 18th, 2009 at 1:32 pm	and is filed under animal cupcakes, baby shower cupcakes, Easter cupcakes. You can follow any responses to this entry through the RSS 2.0 feed. Responses are currently closed, but you can trackback from your own site.